For decades clinicians have been taught that pulmonary embolism—defined by the National Institutes of Health as a “sudden blockage in a lung artery”1—always matters and to be vigilant because a missed embolism can be fatal.2 When a patient presents with shortness of breath, pleuritic chest pain, tachycardia, or signs of right heart strain, clinicians are trained to think “pulmonary embolism.” Because these symptoms and signs are neither sensitive nor specific, scoring systems (such as the Wells criteria) have been developed to help clinicians decide which patients to scan,3 although in practice, many clinicians simply proceed with imaging4 to confirm or refute the diagnosis. Until recently, ventilation-perfusion (VQ) scanning, introduced in the mid-1960s, was the first line test for pulmonary embolism (table⇓) with clinicians maintaining an appropriately high threshold for invasive pulmonary angiography.5 VQ scanning has the advantage of being non-invasive, but the results are often inconclusive. A new technology introduced in 1998—multidetector computed tomographic (CT) pulmonary angiography—offers higher resolution and more definitive results. With the increasing availability of CT scanners, there has been an explosion in the use of CT for various indications,6 including pulmonary embolism. A 2005 US survey of emergency department physicians showed that most considered CT pulmonary angiography to be the first line test for pulmonary embolism.7 This finding is consistent with observations in health maintenance organisations8: use of CT pulmonary angiography rose 14-fold (from 0.3 to 4.0 per 1000 beneficiaries) while VQ scanning decreased by 52% (from 2.3 to 1.1 per 1000 beneficiaries) from 2001 to 2008. The rising incidence of pulmonary embolism and stable mortality is particularly striking given the simultaneous push for venous thromboembolism prophylaxis for hospital patients, most notably through the adoption of a national quality measure (http://qualitymeasures.ahrq.gov). More systematic use of prophylaxis would be expected to decrease both pulmonary embolism incidence and mortality. Nevertheless, incidence has risen. This rise is unlikely to represent a true change in the underlying rate of pulmonary embolism, as the major risk factors for pulmonary embolism have not shown a parallel increase.27 The more likely explanation is increased use of CT in general6 resulting in incidental detection of pulmonary embolism on contrast CT scans performed for other reasons20 21 22) and CT pulmonary angiography specifically. Inferring overdiagnosis by observing epidemiological trends has limitations because the evidence is derived from administrative data (coding on discharge records and death certificates) with imperfect accuracy, insufficient clinical detail, and lack of standardisation across institutions. But its strength lies in its representativeness of the population and reflection of actual clinical practice, in contrast with randomised trials that study a highly selected population under highly controlled conditions. The best evidence of overdiagnosis comes from a trial that randomised 1417 patients with an intermediate to high probability of pulmonary embolism to receive VQ scanning or CT pulmonary angiography.30 Although CT pulmonary angiography detected more emboli than VQ scans (19.2% v 14.2%, P=0.01), there was no difference in death from pulmonary embolism or other unknown causes (0.3% v 0.3%) over three months. Definitive evidence of overdiagnosis would, of course, be the finding that untreated patients never experienced harm from the pulmonary embolism during the rest of their lives and died from another cause, but no such studies exist. Overdiagnosis and overtreatment are also costly to health systems. The mean charge associated with admission for pulmonary embolism in the US increased from roughly $25 000 (£17 000; €19 000) to $44 000 between 1998 and 2006.35 The mean cost of subsequent warfarin anticoagulation, associated laboratory tests, and clinic visits was $2694.36 The recent introduction of newer anticoagulants (dabigatran, rivaroxaban) will decrease the need for testing, but the drugs are substantially more expensive than warfarin ($3000 v $48 a year37). Pulmonary embolism is underdiagnosed as well as overdiagnosed,38 and ideally, improved tests would make it possible to find all clinically important emboli before patients experience an adverse outcome. Unfortunately, although highly sensitive tests find more emboli, they do so at the cost of overdiagnosis. Avoiding CT pulmonary angiography in patients with a low likelihood of pulmonary embolism would reduce exposure to nephrotoxic contrast and carcinogenic radiation. The average effective radiation dose from a CT pulmonary angiography is 10-15 millisieverts (compared with 2-2.5 mSV for a VQ scan and 5 mSV for invasive pulmonary angiography).10 46 The radiation exposure is particularly worrisome for young women; for every 1000 20 year old women who have CT pulmonary angiography, about three will develop cancer.10 Less CT pulmonary angiography would also mean fewer false positive results and “incidentalomas.” Roughly a quarter of CT pulmonary angiographs detect an unexpected abnormality such as a pulmonary nodule, thyroid nodule, or adenopathy, resulting in further scans or invasive testing to rule out cancer.47 Most are false alarms. Although some guidelines recommend anticoagulation for all pulmonary emboli,41 49 others acknowledge that anticoagulation may not be warranted in all cases because of uncertainty about the balance of benefits and harms for treating isolated subsegmental pulmonary embolism.11 40 Some authors suggest withholding anticoagulation for stable patients with isolated subsegmental pulmonary embolism and adequate cardiopulmonary reserve.50 If a subsegmental pulmonary embolism is not treated, patients should be monitored for new respiratory symptoms and for deep vein thrombosis with serial ultrasonography for three to six months to decide whether anticoagulation can be safely withheld. Many unresolved questions remain which require further research. What is the natural course and prognosis of untreated subsegmental pulmonary embolism? Does asymptomatic, incidentally detected pulmonary embolism have the same outcomes and prognosis as symptomatic pulmonary embolism? What are the benefits and harms of treating subsegmental pulmonary embolism with anticoagulation? Pulmonary embolism is unquestionably an important cause of death, and rapid diagnosis and treatment can be life saving. But the diagnostic zeal and technological advances meant to improve outcomes of patients with pulmonary embolism are double edged swords: some patients are helped, but many are harmed through overdiagnosis and overtreatment. The idea that pulmonary embolism can be overdiagnosed will be new and counterintuitive for some clinicians, but the harms are just as real as those of underdiagnosis. To improve outcomes for all patients, we need to learn more about which small emboli need treatment. Importantly, an ongoing prospective cohort study is assessing the safety of withholding treatment for stable patients with isolated subsegmental pulmonary embolism (ClinicalTrials.gov Identifier: NCT01455818). This article is the first of a series on overdiagnosis looking at the risks and harms to patients of expanding definitions of disease and increasing use of new diagnostic technologies. We thank William C Black for feedback. RSW is supported by a career development award from the National Cancer Institute (K07 CA138772) and the US Department of Veterans Affairs. The funding organisations had no role in the preparation, review, or approval of the manuscript. Data collection on use of CT pulmonary angiography versus VQ scanning in health maintenance organisations was supported by the National Cancer Institute funded Cancer Research Network Across Health Care Systems (U19CA79689). We thank Rebecca Smith-Bindman, UCSF and the investigators at the contributing data sites for sharing these data: Diana Miglioretti and Eric Johnson (Group Health Cooperative), Sheila Weinmann (Kaiser Permanente Northwest), Robert Greenlee (Marshfield Clinic Research Foundation), Douglas Roblin (Kaiser Permanente Georgia), and Andrew Williams (Kaiser Permanente Hawaii). Contributors and sources: Research by RSW (a pulmonologist) and LMS and SW (general internists) has focused on understanding overdiagnosis and overtreatment and on how to improve doctor-patient communication around these complex issues. RSW, LMS, and SW contributed equally to the manuscript. All authors drafted the article, critically revised it for important intellectual content, and gave final approval of the manuscript version to be published. RSW is responsible for the overall content as guarantor. National Heart Lung and Blood Institute. What is pulmonary embolism? www.nhlbi.nih.gov/health/health-topics/topics/pe/. Handler JA, Feied CF. Acute pulmonary embolism. Aggressive therapy with anticoagulants and thrombolytics. Postgrad Med1995;97:61-2, 65-8, 71-2. Wells PS, Anderson DR, Rodger M, Stiell I, Dreyer JF, Barnes D, et al. Excluding pulmonary embolism at the bedside without diagnostic imaging: management of patients with suspected pulmonary embolism presenting to the emergency department by using a simple clinical model and d-dimer. Ann Intern Med2001;17;135:98-107. Adams DM, Stevens SM, Woller SC, Evans RS, Lloyd JF, Snow GL, et al. Adherence to PIOPED II investigators’ recommendations for computed tomography pulmonary angiography. Am J Med2013;126:36-42. Stein PD, Hull RD, Ghali WA, Patel KC, Olson RE, Meyers FA, et al. 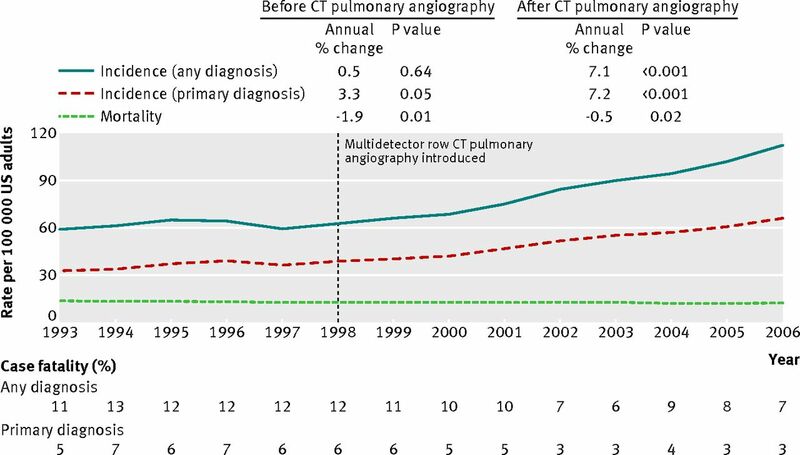 Tracking the uptake of evidence: two decades of hospital practice trends for diagnosing deep vein thrombosis and pulmonary embolism. Arch Intern Med2003;163:1213-9. Smith-Bindman R, Miglioretti DL, Larson EB. Rising use of diagnostic medical imaging in a large integrated health system. Health Aff (Millwood)2008;27:1491-502. Weiss CR, Scatarige JC, Diette GB, Haponik EF, Merriman B, Fishman EK. CT pulmonary angiography is the first-line imaging test for acute pulmonary embolism: a survey of US clinicians. Acad Radiol2006;13:434-46. Smith-Bindman R, Miglioretti DL, Johnson E, Lee C, Feigelson HS, Flynn M, et al. Use of diagnostic imaging studies and associated radiation exposure for patients enrolled in large integrated health care systems, 1996-2010. JAMA2012;307:2400-9. Calder KK, Herbert M, Henderson SO. The mortality of untreated pulmonary embolism in emergency department patients. Ann Emerg Med2005;45:302-10. Smith-Bindman R, Lipson J, Marcus R, Kim KP, Mahesh M, Gould R, et al. Radiation dose associated with common computed tomography examinations and the associated lifetime attributable risk of cancer. Arch Intern Med2009;169:2078-86. Remy-Jardin M, Pistolesi M, Goodman LR, Gefter WB, Gottschalk A, Mayo JR, et al. Management of suspected acute pulmonary embolism in the era of CT angiography: a statement from the Fleischner Society. Radiology2007;245:315-29. Gottlieb RH. Imaging for whom: patient or physician? AJR Am J Roentgenol2005;185:1399-403. Rohacek M, Buatsi J, Szucs-Farkas Z, Kleim B, Zimmermann H, Exadaktylos A, et al. Ordering CT pulmonary angiography to exclude pulmonary embolism: defense versus evidence in the emergency room. Intensive Care Med2012;38:1345-51. Duff Wilson A. Many new drugs have strong dose of media hype. Seattle Times 2010 Mar 16. http://seattletimes.com/html/health/sick4.html. PreventDVT.org. About the Coalition to Prevent Deep-Vein Thrombosis. www.preventdvt.org/coalition/about.aspx. Ghaye B. Peripheral pulmonary embolism on multidetector CT pulmonary angiography. JBR-BTR2007;90:100-8. Stein PD, Henry JW. Prevalence of acute pulmonary embolism in central and subsegmental pulmonary arteries and relation to probability interpretation of ventilation/perfusion lung scans. Chest1997;111:1246-8. Carrier M, Righini M, Wells PS, Perrier A, Anderson DR, Rodger MA, et al. Subsegmental pulmonary embolism diagnosed by computed tomography: incidence and clinical implications. A systematic review and meta-analysis of the management outcome studies. J Thromb Haemost2010;8:1716-22. Goodman LR. Small pulmonary emboli: what do we know? Radiology2005;23:654-8. Minet C, Lugosi M, Savoye PY, Menez C, Ruckly S, Bonadona A, et al. Pulmonary embolism in mechanically ventilated patients requiring computed tomography: prevalence, risk factors, and outcome. Crit Care Med2012;40:3202-8. Ritchie G, McGurk S, McCreath C, Graham C, Murchison JT. Prospective evaluation of unsuspected pulmonary embolism on contrast enhanced multidetector CT (MDCT) scanning. Thorax2007;62:536-40. Schultz DJ, Brasel KJ, Washington L, Goodman LR, Quickel RR, Lipchik RJ, et al. Incidence of asymptomatic pulmonary embolism in moderately to severely injured trauma patients. J Trauma2004;56:727-31; discussion 731-3. Robin ED. Overdiagnosis and overtreatment of pulmonary embolism: the emperor may have no clothes. Ann Intern Med1977;87:775-81. Donato AA, Khoche S, Santora J, Wagner B. Clinical outcomes in patients with isolated subsegmental pulmonary emboli diagnosed by multidetector CT pulmonary angiography. Thromb Res2010;126:e266-70. Heit JA, Lahr BD, Petterson TM, Bailey KR, Ashrani AA, Melton LJ 3rd. Heparin and warfarin anticoagulation intensity as predictors of recurrence after deep vein thrombosis or pulmonary embolism: a population-based cohort study. Blood2011;118:4992-9. Wiener RS, Schwartz LM, Woloshin S. Time trends in pulmonary embolism in the United States: evidence of overdiagnosis. Arch Intern Med2011;171:831-7. DeMonaco NA, Dang Q, Kapoor WN, Ragni MV. Pulmonary embolism incidence is increasing with use of spiral computed tomography. Am J Med2008;121:611-7. Sheh SH, Bellin E, Freeman KD, Haramati LB. Pulmonary embolism diagnosis and mortality with pulmonary CT angiography versus ventilation-perfusion scintigraphy: evidence of overdiagnosis with CT? AJR Am J Roentgenol2012;198:1340-5. Anderson DR, Kahn SR, Rodger MA, Kovacs MJ, Morris T, Hirsch A, et al. Computed tomographic pulmonary angiography vs ventilation-perfusion lung scanning in patients with suspected pulmonary embolism: a randomized controlled trial. JAMA2007;298:2743-53. Auer RC, Schulman AR, Tuorto S, Gonen M, Gonsalves J, Schwartz L, et al. Use of helical CT is associated with an increased incidence of postoperative pulmonary emboli in cancer patients with no change in the number of fatal pulmonary emboli. J Am Coll Surg2009;208:871-8; discussion 878-80. Parvizi J, Smith EB, Pulido L, Mamelak J, Morrison WB, Purtill JJ, et al. The rise in the incidence of pulmonary embolus after joint arthroplasty: is modern imaging to blame? Clin Orthop Relat Res2007;463:107-13. Prologo JD, Gilkeson RC, Diaz M, Asaad J. CT pulmonary angiography: a comparative analysis of the utilization patterns in emergency department and hospitalized patients between 1998 and 2003. AJR Am J Roentgenol2004;183:1093-6. Wysowski DK, Nourjah P, Swartz L. Bleeding complications with warfarin use: a prevalent adverse effect resulting in regulatory action. Arch Intern Med2007;167:1414-9. Park B, Messina L, Dargon P, Huang W, Ciocca R, Anderson FA. Recent trends in clinical outcomes and resource utilization for pulmonary embolism in the United States: findings from the nationwide inpatient sample. Chest2009;136:983-90. Bullano MF, Willey V, Hauch O, Wygant G, Spyropoulos AC, Hoffman L. Longitudinal evaluation of health plan cost per venous thromboembolism or bleed event in patients with a prior venous thromboembolism event during hospitalization. J Manag Care Pharm2005;11:663-73. Gage BF. Cost of dabigatran for atrial fibrillation. BMJ2011;343:d6980. Tapson VF. Acute pulmonary embolism: comment on “time trends in pulmonary embolism in the United States.” Arch Intern Med2011;171:837-9. Lapner ST, Kaeron C. Diagnosis and management of pulmonary embolism. BMJ 2013;346:f757. Torbicki A, Perrier A, Konstantinides S, Agnelli G, Galie N, Pruszczyk P, et al. Guidelines on the diagnosis and management of acute pulmonary embolism: the Task Force for the Diagnosis and Management of Acute Pulmonary Embolism of the European Society of Cardiology (ESC). Eur Heart J2008;29:2276-315. British Thoracic Society Standards of Care Committee Pulmonary Embolism Guideline Development Group. British Thoracic Society guidelines for the management of suspected acute pulmonary embolism. Thorax2003;58:470-83. Choosing wisely: an initiative of the American Board of Internal Medicine. Lists. http://choosingwisely.org/?page_id=13. Van Belle A, Buller HR, Huisman MV, Huisman PM, Kaasjager K, Kamphuisen PW, et al. Effectiveness of managing suspected pulmonary embolism using an algorithm combining clinical probability, D-dimer testing, and computed tomography. JAMA2006;295:172-9. Perrier A, Roy PM, Sanchez O, Le Gal G, Meyer G, Gourdier AL, et al. Multidetector-row computed tomography in suspected pulmonary embolism. N Engl J Med2005;352:1760-8. Raja AS, Ip IK, Prevedello LM, Sodickson AD, Farkas C, Zane RD, et al. Effect of computerized clinical decision support on the use and yield of CT pulmonary angiography in the emergency department. Radiology2012;262:468-74. Mettler FA Jr, Huda W, Yoshizumi TT, Mahesh M. Effective doses in radiology and diagnostic nuclear medicine: a catalog. Radiology2008;248:254-63. Hall WB, Truitt SG, Scheunemann LP, Shah SA, Rivera MP, Parker LA, et al. The prevalence of clinically relevant incidental findings on chest computed tomographic angiograms ordered to diagnose pulmonary embolism. Arch Intern Med2009;169:1961-5. Stein EG, Haramati LB, Chamarthy M, Sprayregen S, Davitt MM, Freeman LM. Success of a safe and simple algorithm to reduce use of CT pulmonary angiography in the emergency department. AJR Am J Roentgenol2010;194:392-7. Kearon C, Akl EA, Comerota AJ, Prandoni P, Bounameaux H, Goldhaber SZ, et al. Antithrombotic therapy for VTE disease: antithrombotic therapy and prevention of thrombosis. 9th ed. American College of Chest Physicians evidence-based clinical practice guidelines. Chest2012;141(suppl 2):e419-94S. Stein PD, Goodman LR, Hull RD, Dalen JE, Matta F. Diagnosis and management of isolated subsegmental pulmonary embolism: review and assessment of the options. Clin Appl Thromb Hemost2012;18:20-6.